Perhaps you have heard April is Grange Month, this is an excellent opportunity for each Grange and member to show your PRIDE. Reach deep and high as you set your goals for yourself and your Grange. Accept the challenge and ask one person to join the Grange, helping your Grange secure one new member per month. Open your halls to the community make them warm and inviting; hold an open house, special program or public dinner. Urge your fellow members to join you in growing your Grange, remember, many hands makes lighter work, and you’ll have more fun as well. Dedicate this time for putting energy into building our membership, bringing greater awareness to our Granges and outstanding Community Service. I am sure by now you have figured out the theme to this column. We MUST show our PRIDE in our Grange and exhibit it daily to those in our communities; we must be PROUD of our accomplishment and not be afraid to tell everyone about them. This PRIDE can be felt at every meeting I attend, from every article I read, from every member I speak with. Your PRIDE in your Grange gives other energy and creates a synergy that will soon become contagious making our future opportunities and achievements boundless. 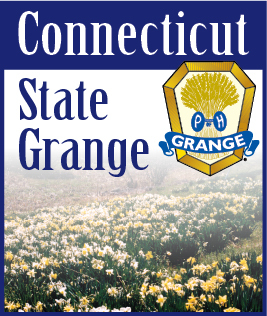 I look forward to attending many Grange Month events with PRIDE, will you join me at some?